We have created art package for secondary schools, find Modern Painters, Digital Photographer, Artists and Illustrators, and The Art of Watercolour. Buy this secondary school magazine package or browse our other packages. Modern Painters is the ultimate source for analysis of contemporary art and culture, covering everything art including visual arts such as photography, architectural design, film, books, and dance. Each issue contains in-depth interviews of artists from around the world; reviews of art exhibitions, shows and festivals; and profiles of contemporary artists, curators, museum directors and collectors. Digital Photographer is an essential read for photographers of all abilities. Every issue is packed with interviews with leading expert photographers, cutting-edge imagery, practical shooting advice, editing tricks, professional insight, career advice, kit reviews and the very latest high-end digital news and equipment reviews. Artists and Illustrators brings a blend of oils, watercolours, portraits and landscapes, abstract art and more all in one publication. Written for artists and art lovers, providing practical painting advice and inspiration. Find a colourful palette of artist profiles and features, practical ideas, and how to guides from leading artists. 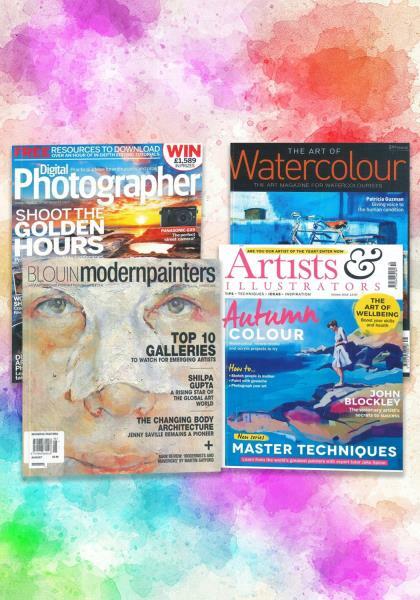 The Art of Watercolour is all about watercolours with high standard articles written by watercolourists from all around the world, for both beginners and professionals. Even find technical advice, practical guides and lessons to help perfect your painting skills.